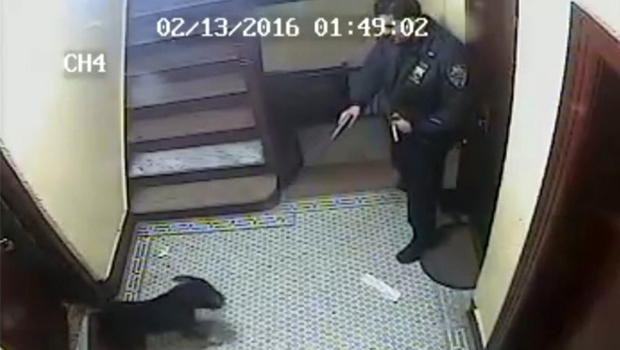 NEW YORK -- A woman's dog was shot to death by a New York police officer, and the devastated woman wants the officer held accountable, CBS New York station WCBS-TV reports. The Bronx woman said the officer had no reason to open fire. The entire episode was caught on video. "He was my beloved, and now he's gone," Yvonne Rosado said Thursday. She relives the moment when her dog, Spike, was killed every time she leaves her apartment. "It's like a tearing inside that I feel every day when I open that door and I see that in my head, him just lying there twitching," Rosado said. It happened in the stairwell of Rosado's building in the Fordham section of the Bronx last month, when a neighbor called police for an unrelated issue. The neighbor said she was talking to officers when Rosado cracked open her own door to see what was going on. Spike, a pit bull, slipped out to investigate. "When I realized that it was an officer in front of the door, I said, 'He's friendly! He's friendly!'" Rosado said. Surveillance video shows Spike coming out of the apartment. His tail was wagging as he ran over to the officer, who pulled his weapon and shot him at point-blank range. "The officer just started backing away, and I thought he was pointing his finger at him, but he pointed the gun and shot," Rosado said. "Everything happened in less than one minute." Rosado ran out of her apartment in her underwear; it was early in the morning. She tried to comfort the animal while the officers backed down the stairs. The video was too graphic to show on television, but it was clear that the dog was not instantly killed. "He was still wagging his tail as he was dying," Rosado said. "It's the worst thing." Rosado was hysterical and followed the officers. "I was very emotionally upset," she said. At that point, she said the officers took her down. "They jumped on top of me - three men," she said. "I'm in my undergarments in the hallway." "They pinned her down to the stairs," added neighbor Irma Santiago. "Her whole back was black and blue." Rosado said the incident has left her traumatized. She has retained attorney David Thompson of the firm Stecklow & Thompson, and she said all she wants now is justice. "I want the officer to be disciplined for what he did to my beloved because he tore away something, a family member," Rosado said. The NYPD has not released the name of the officer who fired the shot. The department said the incident is being reviewed by the Force Investigation Division.